All praise is due to Allaah, Lord of all that exists, and may the peace and blessings of Allaah be upon the Messenger Muhammad, his family, his Companions and his followers till the Day of Judgement. ‘Alee bin Abee Taalib (radiyallaahu ‘anhu) said it means: “Teach them good manners, and teach them goodness.” So upon the father is to take the responsibility of cultivating the affairs of his family so as to achieve that goodness. So cultivating one’s children upon good is from the most virtuous types of worship, due to what follows on from that of benefits – both specific and general, and due to what it contains of hardship and pain. One should be sincere with regard to his children, fear Allaah, and seek His Pleasure. It is mind-boggling that many Muslim parents pay so much attention to worldly affairs and worldly ambitions for their children whilst neglecting their “spiritual” and religious welfare. They further compound that lack of Islamic nurturing with instilling poor manners, bad character and lack of common decency in their children – they teach their sons and daughters to be arrogant, haughty and to look down upon upon others. They turn away from from feeding the poor, and being courtesy to the neighbours. They are not taught to respect elders or to give the scholars their rights. Indeed, we find Muslim youth, boys and girls, right into their teenage years who know the names of more Hollywood movie “stars” than they do the names of the Companions of Allaah’s Messenger (salallaahu alaihi wassallam) or the name of the Prophets of Allaah, the Most High. And Allaah’s aid is sought from this type of wicked cultivation. We have seen parents spending hundreds of Pounds (Euros or Dollars) on private tuition on their children to help them excel in Mathematics or Science or Geography, yet they become extremely niggardly when it comes to expending wealth on Religious education. Worst still, they will spend huge amounts of wealth on secular educations, and will turn away from Religious knowledge (of the Qur’aan and Sunnah) even when it offered free, as it is at Salafi Mosques in the UK, Europe, Canada and the USA! So you do not find the Messenger (salallaahu ‘alaihi wassallam) leaving off this opportunity to teach his grandson important lessons. He would also teach the young boys table manners: “O young boy! Eat with your right hand and eat what is close to you.” Learn from this Prophetic example, and do not overlook an opportunity to teach the young. It certainly not correct that parents behave in manner that contradicts that which they are trying to install into their children. Young people are very perceptive and recognise contradictions and irregularities in their role-models. Sending mixed messages and behaving hypocritically has a very bad effect upon children from various aspects: 1. They begin to think that hypocrisy is normal. 2. That it is quite acceptable to lead a double-life, whereby you say one thing and then do something in utter contradiction to that. After all, mother and father [the two people to whom children look towards the most to emulate] behave like that! 3. They begin to think that lying and deception is an acceptable norm in society because you pretend to be pious but in reality you far from that! 4. Children enter into adulthood with these unsavoury and un-Islamic traits. 5. Over time, children lose respect for their parents. 6. These traits are harmful to society as a whole. 7. They lead to the displeasure of Allaah and His punishment. So parents must be good role-models, the best of examples. Do not be from those who, for example, pray Fajr (or the other prayers) late, and the children grow up thinking that is an acceptable practice in an Islamic home. This, of course does not necessitate that a Muslim does not feed the poor who are deficient in Imaan or to withhold general charity from non-Muslims. Rather it means that one does not take as his close companions those who are sinful and are not fearful of their Lord – and not to take such people as ones that you always eat with and are seen with. A person is judged in Islaam according to his companionship. Al-Khattaabee and others have stated that this due to the fact that when a person eats food with someone, it draws his heart closer to him and he inclines towards him. Also note that there is a difference between advising a sinful person and inviting him to Islaam and the Sunnah and between taking such people as friends and companions. So, no doubt it is permitted (rather correct) that the sinners be invited to Islaam with kind and gentle treatment, but that does not necessitate companionship. Some fathers (may Allah guide them) do not even know where their children go off to much of the day, nor who their friends are, or how they are spending their time. They may even leave the job to the mother and it is known that the mother is not able to follow them up in every affair. And even worse than this is when this duty is left off altogether and the children are left to fend for themselves! The first and foremost companion and confidant of any child should be the mother and father. The Prophet (salallaahu ‘alaihi wassallam) was asked on an occasion as to who has the most right to one’s companionship, he responded: “Your mother.” He was then asked, “Then who?” He replied, “Your mother.” He was asked, “Then who?” He replied, “Your mother.” He was asked, “And then who?” He responded, “Your father.” So the mother has the greatest right of one’s close friendship, companionship and affinity followed by the father, and then the siblings. Why is it that we do not nurture our children in a manner that they stay close to the mother and father as a family? Why is it that the youth seek the companionship of the streets and thugs and gangs and so on? Because parents don’t pay attention to this affair of companionship. Early on in the child’s development, fathers and mothers should build bonds with their children. How? Here’s some ways: 1. Travel together. Journeys together are great times to bond and get to know each others and talk! 2. Perform Umrah together (annually or every two years). 3. Going for walks together in the parks, countryside or hills (weekly or fortnightly). 4. Cooking together (with sons and daughters). 5. Attending duroos together. 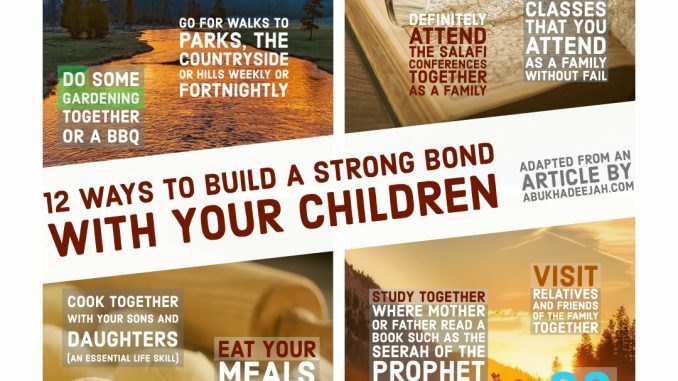 Choose one or two Salafi classes a week that you attend without fail as a family. 6. Attending conferences together. 7. Reading daily Qur’aan together as a family. 8. Studying religious knowledge together as a family, where the mother or father reads a book, such as Seerah of the Prophet, to the family (even if its 20 minutes per day!). 8. Shopping together. 9. Gardening together. 10. Visiting relatives together. 11. Eating meals together, out of one dish. Other than one’s family, then the children can keep company with children of likeminded parents, who have similar aspirations for their children as you. If you live an isolated corner of the country where you are struggling due to the lack of a good strong Salafi community, then maybe its time to consider relocating to save your children from destruction. No highly paid job is worth losing your children for. Accepting a lower salary in a less affluent part of the country is worth it if the end result is pious, well-mannered and caring children upon Salafiyyah! Enrolling your sons and daughters in the Salafi schools and in after-school Madrassahs for the learning and memorization of the Noble Qur’an that are established within Salafi Mosques. These institutions must be safe, and not known for beating children and thus turning them away from the Religion. Young children must be nurtured and not beaten. And alhamdulillaah, this is not the method the Salafis use to teach their children. One must also avoid the centres, schools, and mosques of bigoted partisanship (hizbiyyah), misguidance and innovation. The Salaf used to say that children are upon their initial upbringing, and it is this initial education that moulds them for the future. So keep them away of centres of misguidance, extremism and Sufism. It is important that the meanings of the Qur’an are also taught at these schools. It is a strange and erroneous methodology of teaching wherein children are taught to memorize without knowing what they are memorising. So make sure your children are learning Qur’aan, learning the meanings of the Qur’aan and learning the Arabic language. Protecting the children from satellite channels, TV, and the internet where they may be exposed to immoral and haraam speech, images and music such as movies and soaps which are based upon glorification of fornication, infidelity, disobedience, disrespect and sin – likewise those cartoons which contain sin and disobedience and even idolatry and disbelief. These are affairs that the Muslims have become lax and easy-going with – many are heedless and foolish with regard to their responsibilities in this affair. If your children need to access the internet, then make sure you have strong parental controls on all of the computers they access. One the best and simplest and free parental controls is k9webprotection.com – make sure access to social forums and media is blocked, as well as youtube and other sites that lead youth astray when used irresponsibly. The same can be said about smartphones and iPhones. If you wish your children to have these devices then they should be controlled with strict parental controls as a safety measure against obscene images, videos and music. I would go as far as to say, there is no need for any parent who cares about the mental and psychological welfare of his child (whether Muslim or non-Muslim) to have terrestrial or satellite channels in the home. If there is any particular beneficial documentary, one can simply download and watch it, if there is need for that. To teach them the affairs of Islaam and Imaan and to implant and nurture veneration, love and awe of Allaah in their hearts – and establish them firmly upon Tawheed. And to love the Prophet (salallaahu ‘alaihi wassallam) by explaining his virtues and the excellence of following him. Inculcate this into their hearts by reading his Seerah (biography), his bravery and courage, his kindness and generosity. To teach them good manners and etiquette and how to behave in private and public; To distinguish between appropriate and inappropriate behaviour; To know about the dress code of the believers [men and women]; the manners of the masjid and how to behave in it. The manners of eating and drinking; personal hygiene and tahaarah (purification); to wait for mother and father to begin and serving them first; not over-eating and reaching over others. Also how to behave around elders, friends, relatives and scholars. Not interjecting when elders are speaking, or pushing in through the door before the mother and father, or pointing their feet towards them or towards the teacher or scholar; Teaching them to constantly say please and thank you, and to be upon the remembrance of Allaah (dhikr); To pray on time; To sit after the prayer and make dhikr; Teach them short hadeeth and du’aas to memorise. Teach them to speak with clear speech that is free from street slang and obscenities. To be strong in body and character and resolute upon the Haqq – not swayed from it. Having self-respect and being proud of manifesting Islaam instead of trying to hide it! Teenage boys and girls are taught to lower their gaze and control their urges and desires, and prepare themselves for marriage. Parents should not delay the marriage of their sons and daughters unnecessarily, nor refuse a proposal for their children from a pious suitor who is Salafi. Parents also must not compel them to marry anyone they are not pleased with – and forbid them from marrying sinners and innovators. Parents should be open-minded and not marry only into their own race. A pious Salafi is a pious Salafi, whether he be Somali, Pakistani, African, Caribbean, Chinese or Arab. Marry your daughters to the one who is the most pious and able to take care of them with respect and honour. Teach them not being shy of wearing the hijaab for the teenage girls, or thawbs for the teenage boys. These must not considered as garments merely for the Mosque, these are our daily garments that we and our children are pleased and proud to adorn our bodies with. They should be taught to honest and truthful, and never lie, deceive, steal or oppress. And if they fall short and sin, teach them how to repent to Allaah, and return the rights of others. They must be taught the rights of a Muslim upon another Muslim: to return the salaam, to visit the sick, to attend Salafi funerals, to give sincere advice, to respond to the one who sneezes, and to accept invites to the gathering where Allaah is not disobeyed, to keep the ties with relatives (even if they be non-Muslim). Just imagine, O parents! If only all children were cultivated upon this Prophetic Path. We ask Allaah, the most Generous, to grant our us and our children success in worship. Sending them to bed early and waking them up early and to busy their time with those things which will benefit them; and to allow them to engage in permissible play and games for set times without going to excess. Organising their time well so it is balanced between work, study, and play. So be very careful with respect to this affair O parents! Oppression and injustice is darkness on the Day of Resurrection. If you purchase a toy for one, then purchase something for the others, this is the Sunnah and it is justice – likewise which respect to clothing and other provisions and gifts. In this manner the children are taught honesty and justice and this will only increase their love for their parents. Furthermore, this is an affair that is just as important if not more important with respect to inheritance rights. It is unfortunate that siblings are sometimes excluded from the will of their parents and wills are written in contradiction to the Quranic divisions. Women especially are denied their God-given rights of inheritance – and this is from the gravest of sins, so be aware. So this is said when one strives and performs deeds that will aid his affair. He takes the means hoping for a good end result, and if the end result is not as he expected, then he (or she) says: “Qaddar Allaahu wa maashaa’ wa fa’la” (It is but the Decree of Allaah, and whatever He wills He does). May Allaah, the Most High, give us the ability to raise righteous children who are dutiful to Allaah, for indeed it is Allaah who grants success. 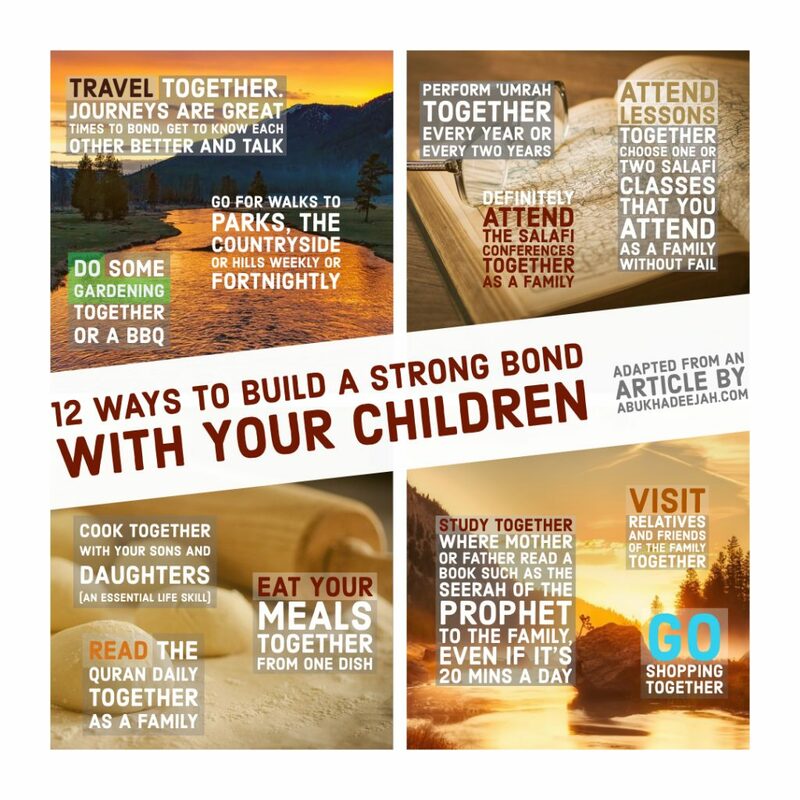 I explained these points in more detail → in this lecture delivered at the “Nurturing the Family” Winter 2013 conference in Birmingham Salafi Masjid. In the compilation of these twelve points, I benefitted from a Dars I read in volume one of “Ad-Duroos al-Muntaqaat al-Kalimaat al-Mulqaat – Duroos Yawmiyyah”.